Claude Debussy (1862-1918). From the 24 Preludes for piano, transcription for clarinet. 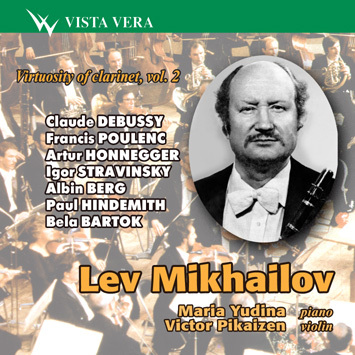 Lev Mikhailov reached the highest standards in his profession and was invited to play in the Moscow Radio Orchestra, the Orchestra of the Bolshoi Theatre and the State Symphony Orchestra of the USSR. Most convincing was his performance of the famous cantilena solo pieces. Amazing by the quality of sound and expressiveness they always ravished the audience and his colleagues. An outstanding musician Mikhailov became a very good pedagogue too: he was invited to teach students at the Department of the Wind Instruments at the Moscow Conservatoire. He was very sociable and well-wishing man and had no enemies. For purely personal reasons he left the country and departed abroad where he untimely died. One would like this disc to become a tribute of memory to a great artist and a true friend of mine.